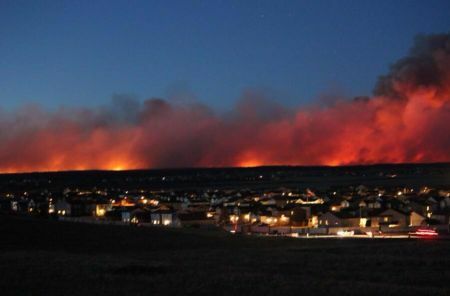 The fires are still burning in Colorado, four now. Mandatory and pre-evacuation boundaries have been expanded, but remain 8 miles to our north. The latest reports say 92 homes are a "total loss." Last summer, 349 burned in the Waldo Canyon fire in Colorado Springs. Thank you, everyone, for your prayers and best wishes. I'm hiding out in the basement sewing room with the A/C on so the smoke doesn't get to me. If there's a bright side, I'm making progress on my Spring Block-a-Day quilt! 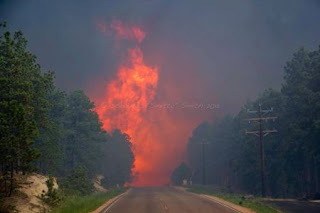 The road makes it appear you are driving into the inferno. The firefighters certainly have their hands full. Oh my gosh! Those pictures are frightening and amazing at the same time. My parents and sister's family are 35 miles away and say they can smell the smoke. I can only imagine how awful it is for you being so close. Stay safe and be ready to get out of there if needed. Those photos are terrifying, Marti. I hope the 8 miles between you and the flames doesn't decrease! Stay safe! I am thinking about you! Hope you are and will be safe! Oh my!! I am so sorry that this is happening there. I will keep you all in my prayers. Stay inside! I hope you have a to-go box ready just in case you need to leave! We have an arsonist in our area that has lit 22 fires in the last 3 weeks! Mother nature causes enough damage and danger. My thoughts are with you. Thinking of you and hoping you stay safe! Hope the fire stays far away from you and yours. Oh Marty, how horrific for your area. We have terrible bush fires in Australia most summers which involve evacuations and massive policies and action plans since so many people have died in them in past years. But they don't usually burn for as long as yours have been. How did they start? Is it from lightening strikes or arsonists? I hope you get some relief soon.